Have you ever been on any Bird Watching Kayak Tours? They are AMAZING! Here is the History of Birding on Kayak Tours through the Mangrove Tunnels of South Lido at Ted Sperling Park. Once upon a time, (now almost thirty years ago), my husband George asked me if I thought, that people would pay to be taken on kayak tours through the “mosquito ditches” on South Lido at what is now known as Ted Sperling Park, and be shown the hundreds of birds that lived there. I don’t remember what I said, but he soon started taking kayakers across Big Pass from Shell Road on Siesta Key, and he did show them the hundreds of birds that lived throughout the areas of Grassy Lagoon, the mangrove tunnels and Brushy Bayou. People were amazed at the incredibly diverse and healthy populations of birds of so many different species, that were clearly visible anytime, as one approached the area that is also near to the southernmost point of Lido Beach, and was known as “canoe trails park”. George is a native of Siesta Key and had spent many hours blazing through the “tunnels” in outboard skiffs and canoes. He and his young Tom Sawyer and Robinson Crusoe type friends, would make their way across Big Pass as little kids in all sorts of watercraft, and spend happy hours exploring the labyrinth of passageways that crisscrossed the islands. What was most striking to him were the birds and how many of them there were! By the time, 1994 came along that property had been purchased by Sarasota County with funding from a referendum that passed the countywide vote at a ratio of 9:1 in favor of the purchase through a ½ millage hike in property taxes that would last 30 years. In 1994 George and I started an eco-tourism company that worked well with my existing windsurfing school. We offered a variety of kayaks for sale in our shoebox size space on US 41 across the street from the Ringling School or Art. Business was great! We had a few tours and a few sales and our friends at Economy Tackle, soon began selling kayaks and well, the rest is history. The opportunity for George to be part of the exploding kayak retail industry with the well established and capitalized Economy Tackle, now known also known as Dolphin Paddle Sports; that was a match that was unbeatable. 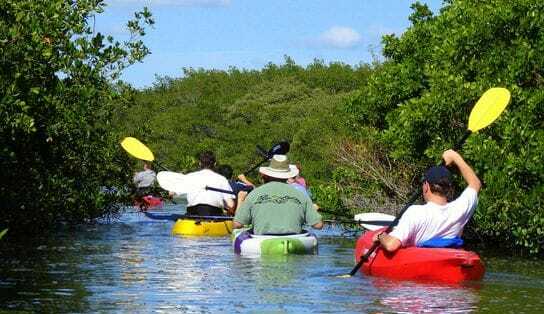 So Economy Tackle, also began to promote and offer Bird Watching Kayak Tours through the mangrove tunnels on South Lido and now there were four companies, all of whom operated exclusively outside the park, using the launch and parking only to facilitate guided kayak tours with clients. As the bird populations were depleted and alarm was raised about imminent extinction of species, James Audubon entered the fray. Today, because of the extreme popularity of the site for commercial operators, the bird populations have diminished to where bird sightings are more of an event than a constant nature show as it once was. Ibis, snowy egrets and little blue herons are seen with less and less frequency in the mangrove tunnels but can still be sighted by those who travel to the mangrove tunnels either earlier or later than the most heavily trafficked hours. Because wading birds come out on low tides, to forage the exposed grass flats and shorelines, they are not as likely to be seen during periods when the kayak tours are best for paddling, which is at or near high tide. This can be good and bad because the birds are left to forage when the kayakers can no longer gain access the the grass flats and shorelines of Ted Sperling Park. I conduct Bird Watching Kayak Tours, as well as our tour boat. It isn’t any longer possible to paddle easily to where birds still congregate in habitat that is conducive to their necessary routines of feeding, resting and procreating. Join me on a trip whether by kayak through the mangrove tunnels on South Lido or Quick Pointe Preserve, or to the Bird Islands and the areas of Sarasota Bay where a pair of binoculars or a sharp eye will reward us with the up close and personal but yet respectful and conservative slant in sustainable, modern eco-tourism.